One of our newest products has been so successful since its launch that we have added it to our range of exclusive special offers for September. The Twistfix Damp Check Mesh Membrane Kit offers maximum efficiency when used to isolate internal finishes from damp walls and is now available with a fantastic 10% price reduction until 31st October 2013. 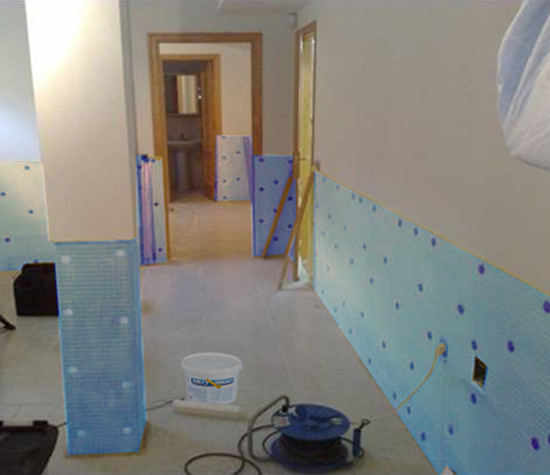 The Twistfix Damp Check Mesh Membrane Kit is primarily used after a remedial damp proof course has been inserted, protecting internal finishes from damp and salts as walls dry-out by creating an effective and durable moisture barrier.­ The use of a membrane is the only method which enables immediate reinstatement of wall plaster following a remedial DPC injection; as opposed to having to wait weeks to plaster in order to comply with British Standards and manufacturers BBA certificates. 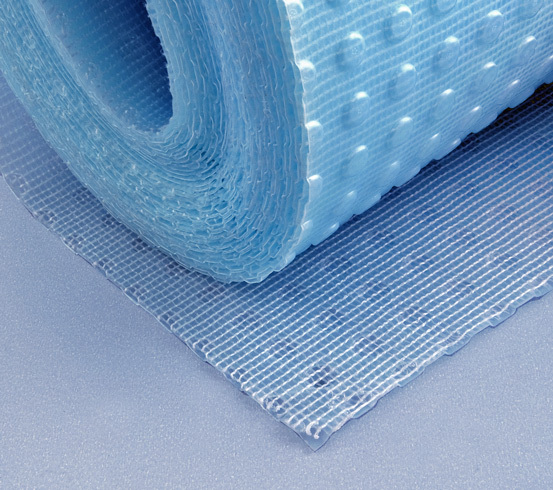 The durable damp proof membrane system offers maximum protection against the penetration of moisture and is thus often used when showers or wet rooms are being built. Quickly and simply installed, the membrane features a mesh face, designed to accept tile adhesives, plasterboard dabs and cement renders, on one side with the other side featuring innovative stand-off studs of a 2mm size. Between the studs are air gaps that allow the wall to ‘breathe’ while making sure any water quickly drains behind the membrane. 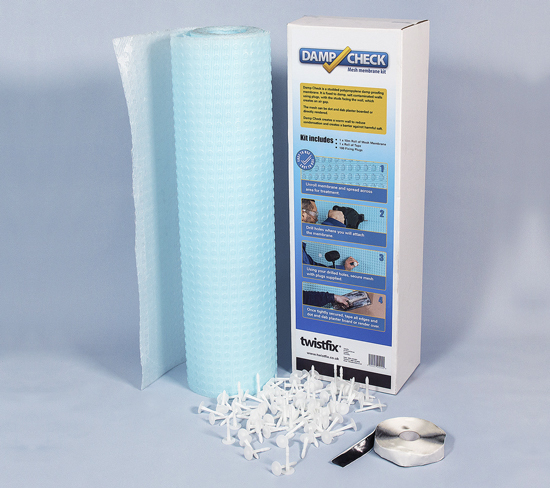 As well as a 10m roll of our effective air-gap tanking membrane, the Damp Check Kit contains 100 hammer-in fixing plugs and 10m of butyl rubber waterproofing tape; this means work can begin right away upon receipt of the kit. The project will progress quickly thanks to the ease-of-use displayed by the membrane, which can be cut with scissors or knife and bent easily around corners and angles. Installing the membrane is simple. Holding it tightly against the surface of the wall, 8mm anchor holes should be drilled before it is secured using the hammer-in plugs provided. The joints should them be firmly sealed with the butyl rubber tape before plaster, dot-and-dab plasterboard sheets or tiles are applied directly onto the surface of the mesh. This essential product is only available with a 10% discount until 30th September 2013 though will after this time, like our entire damp proofing product range, remain competitively priced. Please contact our team for further information. You can call us on 0845 123 6006 or email us at sales@twistfix.co.uk.